Two new charts have been added to display the relationship between codings and variables: The stacked bar chart allows one to display relative or absolute frequency of codings by stacking them for each class of the categorical or numerical variable. It allows one to quickly show the relationship of parts to the whole or to emphasize the sum of several codes. 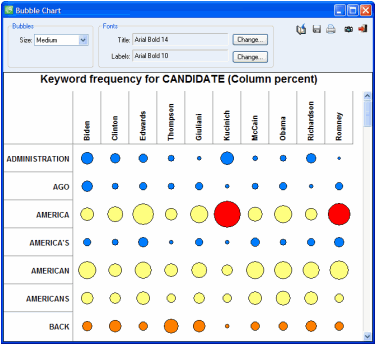 The bubble chart is a graphic representation of crosstab tables where relative frequencies are represented by circles of different diameters. This type of chart allows one to quickly identify high and low frequency cells and is thus especially useful for presentation purposes. Many features of the chart can be customized to highlight specific findings. Rows and columns can be moved freely or deleted, and one can adjust the color of each cell as well as the fonts used. The CODING BY VARIABLE command can now examine the relationship between codes assigned to text segments and the combined values of two variables (for example: Gender x Age). WordStat can now be called from various retrieval tables to analyze the extracted text segments. A new CASES | APPEND FROM A DATA FILE command now allows one to append new cases stored in an external data file. QDA Miner can import cases from another project or directly from other file formats such as Excel, MS Access, or tab-delimited files. An option allows one to ignore cases that have already been imported (incremental importation). Being able to quickly retrieve relevant text segments associated with specific codes or patterns of codes is important. QDA Miner introduces many new ways of retrieving text segments from various tables and graphs as well as those associated with co-occurrence patterns. Variables can now be added to all segment retrieval tables. Those tables may also be transformed into a text report. One can now include the description and the keywords associated with each code when printing codebooks. A new button has been added to various charts and tables to display labels of columns or on the bottom axis vertically rather than horizontally. One can now filter cases based on whether a document contains codes. Such a feature may be used to filter out coded documents and focus on those that still need to be reviewed and tagged. It may also be used to restrict analysis on cases that have been coded. The customization of correspondence plots is now easier with a new dialog box for basic editing. A new dialog box allows you to reorder values of ordinal and nominal variables. A new Export Codings command allows one to create a restructured version of an existing project based on the coding made. Specific codes may be used to define new cases, to split single documents into several or to group topics from different documents into a single one. This feature could be used to transform a focus-group transcript into a project where participants become the unit of analysis or transform an unstructured interview into a structured data file. A new drag-and-drop coding table has been added, providing an efficient way of coding lists of paragraphs, sentences or segments produced using existing text and coding retrieval tools. This new editor is especially useful to quickly code long lists of short text segments, such as responses to open-ended questions, customer feedback, etc. The program now offers three levels of menu systems. FULL MODE displays all options and features of QDA Miner. The BASIC MODE displays only the most basic coding and retrieval functions and hides more advanced features. CUSTOM MODE allows one to choose what will be displayed. The menu level may be associated with specific coders (for example, one could assign the BASIC MODE menu to a coder, the FULL menu to the project administrator and a CUSTOM one to other people). A new APPEND FROM A FILE command in the VARIABLES menu allows one to append variables that are stored in another file to the cases of the current project. On the coding toolbar, four new buttons allow one to more easily browse through cases. The CONSOLIDATE command may now be used to merge codings made by different coders. This feature is especially useful to quickly clean up the project after inter-coder’s reliability has been established. Project administrators may now customize an item under the HELP menu so that users will be able to easily send messages to a specific email address. QDA Miner can now import .DOCX and .XLSX files created using MS Word 2007 or MS Excel 2007. QDA Miner 3.0 supports the coding of graphics (see below) – To access this feature you need to create an Image variable. Once one is created, a tab will appear on the top of the text editor to let you view it. Moving to the graphic tab will show you the graphic coding window allowing you to attach codes to rectangular regions of the graphic. The graphic formats that are currently supported by QDA Miner are: BMP, WMF, JPG, GIF and PNG. A new QUERY BY EXAMPLE command has been added to the Analysis menu. You can now type a full sentence or a list of words and QDA Miner will retrieve text segments similar to this example. It can also be used to find items similar to text associated with a specific code. A “fuzzy string matching” option is also available for partial matching of words (especially useful when analyzing misspelled text but also useful for finding words with similar roots). This new text-retrieval feature causes a lot of text segments to be retrieved. They are presented in descending order of similarity and the user can select those that are relevant as well as some that might not be relevant in order to refine the search. Segments tagged as relevant are automatically moved to the Table of Hits list, allowing users to attach codes to them. This feature can also be accessed by highlighting a section of a document and by selecting the new FIND SIMILAR command (see below) allowing one to find similar sentences, paragraphs, or documents. A new Report Manager has been added. It can be accessed through the REPORT MANAGER command from the PROJET menu. It allows one to store in a single location, those documents, tables, graphics, and text outputs produced by QDA Miner, as well as important quotes. This utility program is structured like an outliner and is similar to the SPSS Output Viewer, allowing one to easily view items, edit them, reorganize them and write draft versions of reports. Buttons like this have been added to many dialog boxes to automatically store tables, charts and text into the Report Manager. Holding the Shift key while clicking on this button will display dialog box that will allow you to customize the title and enter a description of the item saved. One may append quotes to this outline by either choosing a code mark, right-clicking and selecting ADD QUOTE command or by selecting a text segment in the text editor and selecting the ADD QUOTE either from the DOCUMENT menu or the pop-up menu. One may also add a quote from any table of hits by clicking on the new button. You will find this new button in the following dialog boxes: Text Retrieval, Query by Example, Section Retrieval, Keyword Retrieval, Coding Retrieval, Coding Sequences. A new Command Log option allows one to keep traces of almost every project access and operation performed (codebook editing, case and variable transformation, analysis). Comments may also be added to specific log entries. Such a log may be used as an audit trail, to repeat previously performed queries or to reverse some operations (code moving, splitting of codes, autocoding). Note: For cancelling other operations, see the Revert Changes feature. Searching for the GLOBALIZATION code using KEYWORD RETRIEVAL will retrieve all text segments containing any one of those words and phrases. In a sense, the codebook may now be considered similar to a content analysis dictionary, like those used by WordStat. See also IMPORTATION OF WORDSTAT DICTIONARIES below. Note: This also means that it is no longer necessary to own WordStat in order to perform customized KEYWORD SEARCHES. However, WordStat is still required if one wants to do text preprocessing, perform lemmatization, exclude words, use disambiguation rules or if one wants to use a dictionary that has a different structure or measures different dimensions than the current QDA Miner codebook. One can now apply Automatic Document Classification models developed in WordStat to documents or text segments (sentences, paragraphs, coded segments). Results of classification may then be used to assign codes to text segments or values to variables. A new clustering algorithm now allows one to preserve the clustering structure in multidimensional scaling plots, making the interpretation of 2D and 3D MDS maps a lot easier and more consistent with the clustering solutions. Enabling this option allows one to use the MDS module to create maps of concepts similar to those suggested by Trochim, in its Concept Mapping procedure. The CODING SEQUENCES dialog box has been totally redesigned to allow easier identification of important sequences using a heatmap display..
A new option allows one to revert changes made to a project and return it either to its original state when it was opened by the user or to the last time the user confirmed changes made to the project (using the KEEP CHANGES command or the CTRL-K keyboard shortcut). One can now reorder variables in a project using an easy-to-use dialog. A new TRANSFORM | REORDER command allows one to recode existing values of a nominal or ordinal variable or of short string variables. The contextual menu of the Coding Frequency table. A new DELETE MULTIPLE command in the CASES menu many now be used to delete several cases. A new command has been added to easily send a copy of the currently opened project by email. The project may be renamed and filtered and is then stored in a compact ZIP archive before being sent. This feature is useful for sending a project to other coders. An option may be set to automatically merge two or more consecutive or overlapping coded text segments into a larger one. Up to 36 keyboard shortcuts may now be associated with specific codes allowing one to quickly assign codes to the selected text. These shortcuts are available either from the main editor or from lists of hits obtained through the various retrieval tools (including text, section or, keyword retrieval dialogs, query by examples, coding sequences dialogs). When used from the main editor, the coding is applied to the selected text segment. If no segment is selected, the coding will be applied to the paragraph at the caret position. When retrieving sentence or paragraph with the Text Retrieval command, one may now tell QDA Miner to retrieve only uncoded text segments, excluding all text segments that have been previously coded. A new DUPLICATE command has been added to the PROJECT menu, allowing the user to create a copy of the existing project. Although such a feature could have been easily achieved using the EXPORT | PROJECT FILE command, many users were unaware of this option. A new PRINT CODEBOOK command has been added to the CODES menu, allowing the user to print a copy of the codebook. Track bars with sliders have been added to the correspondence analysis dialog box allowing one to adjust the position of groups in correspondence plots. Dictionaries created using WordStat may now be imported into QDA Miner and transformed into codes and categories. In this transformation, WordStat categories containing sub-categories are transformed into codebook categories, while all other categories (without sub-categories) are transformed into codes. Words, word patterns and phrases are imported and stored as keywords for the newly imported code (see CODE KEYWORDS AND KEYPHRASES). The MERGE PROJECTS command now allows one to append logs as well as report entries created by other users. The Multi-users settings that were part of the project’s PROPERTIES command have been moved to this sub-menu. A list box has been added to the Code Frequency dialog box to select specific document or image variables and to compute statistics on those selected variables. New options have been added to the VARIABLES | COMPUTE and PROJECT | EXPORT | STATISTICS command to store code occurrences in multiple polynomial variables, allowing to store a large number of code occurences in a small number of variables. The CODING AGREEMENT dialog box now offers the possibility to filter the table of coded segments so that it will show only agreements or disagreements. In prior versions of QDA Miner, to assign a text segment to a new code, one had to create the code first, then highlight the text segment and assign the new code to it. A new button has been added to allow one to perform this operation more quickly. Co-occurrence data may now be exported to popular social network analysis software such as UCINET, Pajek, NetDraw and NetMiner.